Recipe Of the Day: Spiced Apple Pulled Pork Fajitas! I'm always dabbling around trying to make up new recipes for us to eat. Two weeks ago I decided I was going to try something different. 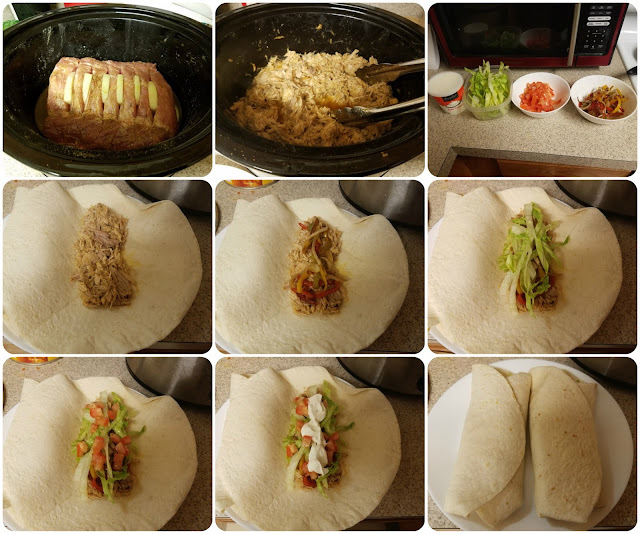 I was going to make Spiced Apple pulled pork fajitas! I didn't know how they were going to come out so I was a bit nervous. After it was finished, let's just say, it was a huge hit in the household! Cut slits into sirloin and tuck apple slices in. Place the sirloin into the slow cooker and add water. Adding water will make the pork sirloin, even more, juicier. After that is finished cooking, You'll want to shred the meat. While that is sitting in the juice, saute the peppers and onions in a teaspoon of olive oil. Cut the lettuce and tomatoes and warm up the tortillas. I hope you liked my recipe! If you tried it yourself, let me know in the comments how you like it!